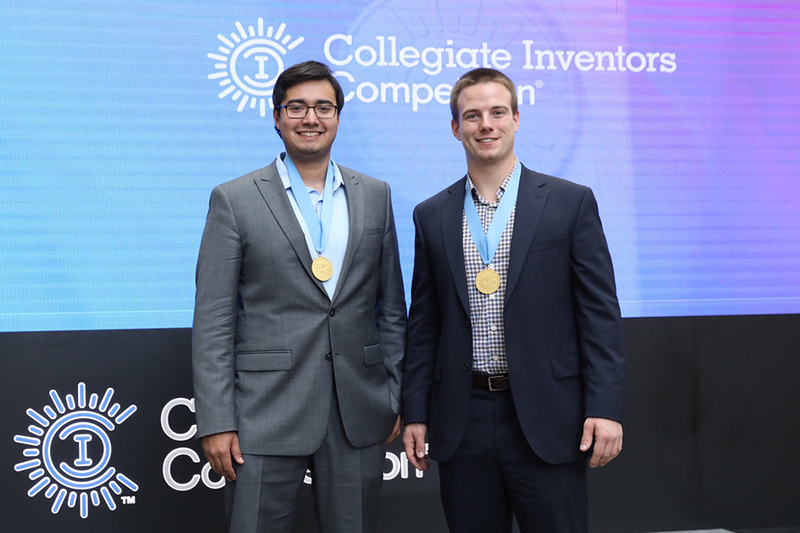 University of Iowa spin-out company SwineTech recently won the undergraduate gold medal at the National Inventors Hall of Fame Collegiate Inventors Competition in Alexandria, Virginia. SwineTech founders Matthew Rooda and Abraham Espinoza developed a system called SmartGuard that prevents sows from rolling over on and crushing their piglets. They started the company while students at UI using resources from the John Pappajohn Entrepreneurial Center (JPEC) and are housed in JPEC’s Bedell Entrepreneurship Learning Laboratory (BELL). The team also won $10,000 during ceremonies on Friday, Nov. 3. Also honored was the team’s faculty advisor, Thomas Hornbeck, adjunct instructor of computer science. A program of the National Inventors Hall of Fame, the Collegiate Inventors Competition recognizes and rewards the research, innovations, and discoveries by college students and their advisors for projects leading to inventions that have the potential of receiving patent protection. Introduced in 1990, the competition has awarded more than $1 million to students for their innovative work and scientific achievement through the help of its sponsors.